Arrive at Mimosa Glenn Homestead and Cottage on Friday night, check in – then get ready to start your Heathcote Wine Indulgence Weekend. Enjoy freshly prepared wood-fired pizza and a glass of our neighbour’s finest drop, at McIvor Estate when you settle in for your Friday night dinner reservations. We’ll make sure your fridge is fully stocked with both, full English breakfast and continental options, for both mornings. We use only the freshest, local products and choose to support our neighbours with McIvor Farm Foods bacon, free range eggs and locally made sausages. 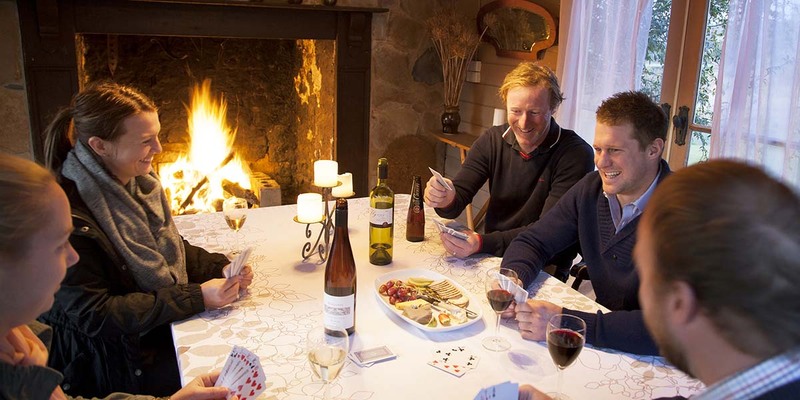 After breakfast set off on Saturday morning and explore the Heathcote Wine Region, make your own way or choose to include a bus and driver in your package. We’ll provide you with a map of the region but always recommend you start your tour with a visit to Heathcote’s own Wine Hub, where you’ll find more than 20 wines available on tasting and great advice on cellar doors to visit. We’ll book a table on behalf of your group at Flynn’s Wines cellar door and cafe, where you’ll experience a tour of the barrel room and a tasting with the winemaker before you sit down to lunch, and of course a glass of wine of your choice. Once you’re finished lunch, set off for some more exploring or just head back to Mimosa Glen for a retreat, or perhaps an in-house massage before dinner. A small bus will collect your group from Mimosa Glen, for your dinner reservations at the Willow Room, where you will enjoy a sumptious 3 course feast before returning to Mimosa Glen by bus at your nominated time. On Sunday morning when you’re ready, pop on the bacon and eggs before you head off home. On your way out, we suggest you visit our neighbours in Tooborac; McIvor Farm for a range of cold and cured meats, Merindoc Cellar Door for a bottle or two, Tooborac General Store for some homemade produce and the Tooborac Hotel for a couple of sensational souvenir ales. The Mimosa Glen Winery Indulgence Weekend package is available for groups of 10 people, ask us about including an additional bus service in your package. We can also tailor packages to meet your group’s individual needs.